New Updates and Features Coming Soon to our Online Catalog! 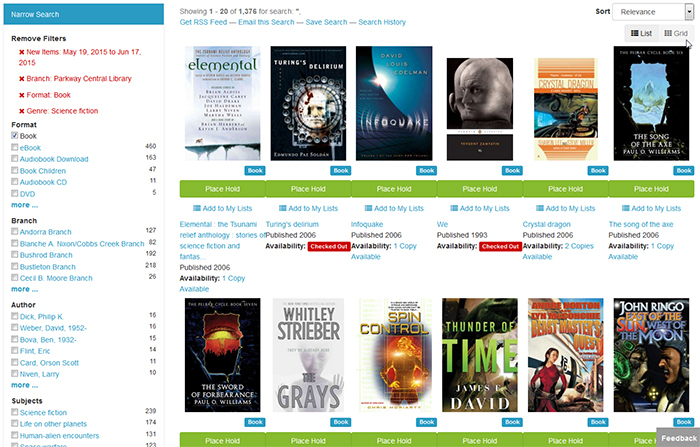 The Free Library has been hard at work upgrading our online catalog to make it more user-friendly, encourage exploration, and offer better customer service. With many suggestions and feedback from both staff and the public, we will be launching our new and improved online catalog on Tuesday, June 23rd! 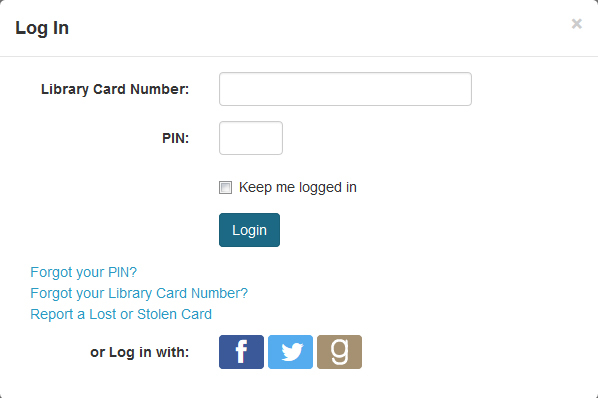 Online Registration – Users can now sign up for a library card online and instantly receive a library card number and PIN via email! 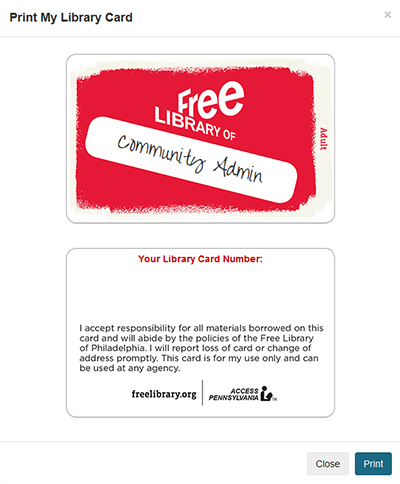 You can even print out a copy of your library card with your name on it! 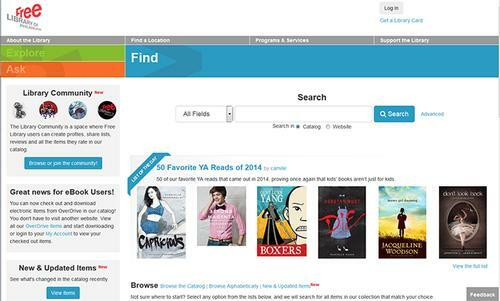 Overdrive Integration – A big announcement for all our voracious ebook reading customers: You can now login to your account, place holds, and check out items from Overdrive directly in our catalog! 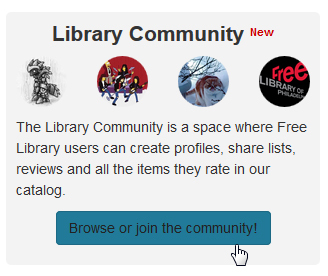 Library Community – An interactive feature that provides an online space where library card holders can create a public profile, make and share lists of books, movies, music, tag titles in our catalog, review and rate items they like or dislike, and much more! Login with your Facebook, Twitter, or Goodreads Account – You can link your Facebook, Twitter, or Goodreads account to your Online Account, allowing for an easier login option if you can’t always remember your library card number and PIN. Refined Formats – We’ve added new formats such as Audiobook CD, Audiobook Download, Book Children, Music Download, and Music Vinyl to help you filter and narrow down your searches easier. New & Updated Items – A more accurate and daily listing of all the new and updated items in our catalog, from the newest bestsellers and award-winning books to the latest dvds and blu-rays to music cds, podcasts, and more! Make sure to check out our blog on Tuesday for some video tutorials and overviews of the catalog and its new features! Will the hold limit be lifted? Ten is entirely not enough, especially when you are number 300 for the new releases. Thank you. On advanced search, is there a way to list a subject that is not on the list? I would like to be able to type in my own Thank you! What happened to the many books/lists I had saved in Overdrive? Can I still access it? 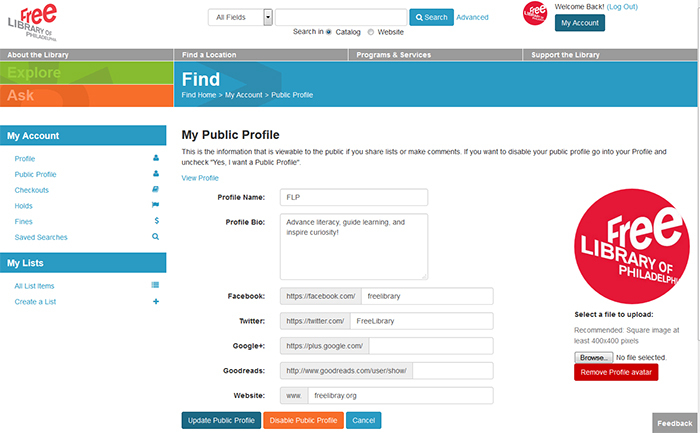 Add a Comment to New Updates and Features Coming Soon to our Online Catalog!